Hello everyone and welcome back!! Today I have a super fun project to share with you that uses a 3D frame for the newest Peachy Keen Stamps Challenge called You've Been Framed. For my project, I found one of those cheap wooden frames at the craft store and painted over it with some light tan acrylic paint. I then stamped the frame with the new Lattice Background stamp and then sanded it down in some places and at the edges for a distressed look. The cloud background is the Cloudy Day stamp set. 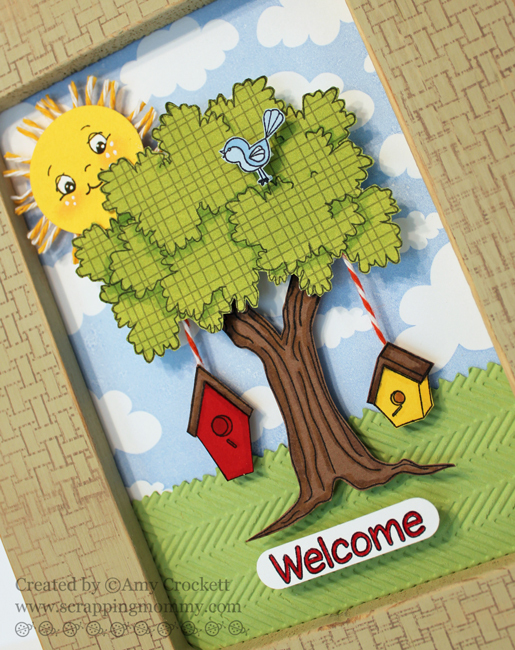 The tree, birdhouses, little bird, and welcome are all from the new SUPER CUTE Home Tweet Home stamp set and I paper pieced them all from scraps. The sunny face is from the Wide Eyed Kids face assortment stamp set. I cut the grass with my Cricut and embossed it with my Cuttlebug and the Herringbone embossing folder. I added some shading to the tree and birdhouses with my Copic markers. The sun has some rosy cheeks compliments of my pink chalk and I also added some white pen details with my white gelly roll pen. The birdhouses and sun all have sum fun bakers twine from The Twinery added to them. I used foam adhesive to raise them all up off the background piece. I used two or three different layers of foam adhesive in a couple of places for extra dimension. I hope that you hop on over to the Peachy Keen Stamps Challenge blog to check out the details, see what the other fab designers have created and to join us this week. Great job! I like your sun rays and the extra touch w/your copics! Your card is beautiful! The background is gorgeous and the tree is so fantastic! What a fabulous card! Amy, this is so cute! The frame turned out perfect and the inside is awesome. The little sun is adorable peeking out from behind that tree like that! Just darling, so sweet to set around!!! Amy ~ Okay I want this frame! This is just so GORGEOUS and ELEGANT looking! Just when I think I DON'T need a PKS stmap set I have to see this! Oh my ~ LOVE it! I just ADORE your coloring!